Since January 2009, there has been a push by President Obama toward transparency and open government based upon the assertion that openness strengthens democracy and promotes efficiency and effectiveness in government. The Open Government Directive, issued by the Office of Management and Budget, directed federal agencies to take specific action to implement three principles: government should be transparent, government should be participatory and government should be collaborative. 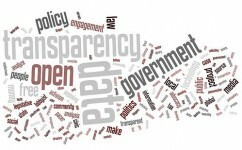 In May 2013, an Executive Order directed the creation of an Open Data policymaking open and machine-readable the new default for all government information. Since that time, more than 3.74 million records have been released and made public and 39 states, 46 cities and counties, 44 international countries and 163 international regions have created Open Data Sites. A recent U.S. Open Data Census identified and ranked 55 cities and 530 datasets regarding their openness in providing full information on 18 categories (e.g.,crime, code enforcement violations, budget) with San Francisco and New York being scored the highest and St. Paul, Minnesota scoring the lowest. By doing your research, they mean determining which sites or forums are most popular for your targeted audience and search websites using keywords to find users and groups talking about your subject/topic. For example, type keywords into Google BlogSearch to find blogs with content relevant to your subject area. Spend some time checking out discussions already in progress and even join relevant groups. By creating an interesting profile, they mean setting up an engaging presence that builds trust by posting a friendly picture, a logo, an organizational description and a website URL as well as using the same information for all profiles maintaining a warm, helpful and professional stance by offering friendly advice and tips. By listening, they mean get a feel for the tone of the conversations already in progress, which will help you strike the right note when you join in. Ask yourself, what are people most excited about? What topics come up again and again? What are the most common problems people are facing? What products or services are they talking most about? By engaging, they mean determining why people spend time visiting social websites and what their most popular activities are – corresponding with family and friends? Watching funny or informative videos? Meeting and socializing with online friends? Recommending interesting articles to fellow readers? By contributing, they mean sharing information with your audiences by focusing on providing value like giving expert advice, sharing thoughts about government services, providing constructive feedback, telling stories and encouraging feedback on products and services by asking questions. By participating, they mean focusing on being someone worth knowing through what you say and how you contribute to conversations as well as providing prompt and polite responses that include great information and a helpful persona. Everyone indicated that social media use needs to be phased in due to the many potential pitfalls of inappropriate use. The case of the Roanoke, Virginia police department launching a Facebook page as part of a crime prevention initiative in November 2009 may be a good example of how to make it work. In 2009, the Facebook page was used to post crime prevention information, surveillance pictures and videos of suspects. It was effective for about a year and then the department realized that it needed to adapt to the ever-changing technology if it wanted to maintain open communication with its citizens. It launched a three-phase plan to support traditional community policing with cyber-community policing. Phase One began in 2011 with an increase in the frequency of posts to Facebook and photographs of officers at community events and crime analysis information. The department held its first social media community meeting designed to teach citizens how to set up their own Facebook pages and protect their identities online. A focus was placed on educating the elderly and homebound who often could not easily attend community meetings. Phase Two began with a media conference that highlighted the changes made in the department’s Facebook page, including monthly videos, an interview with a major crime detective, a virtual tour of the police-training academy and a virtual tour of a staged crime scene. The police department also collaborated with a television channel to provide an interactive communication between citizens, the news anchor and the deputy chief to answer questions about the department’s use of technology. There were stories like a runaway dog that made a temporary home in a lieutenant’s patrol car until his owner came forward 4 days later and a man walking through a mall with a gun forcing the evacuation of shoppers and a thorough sweep of the facility by tactical response teams. Events like these increased site visits from 791 visitors to 1,557 in a day, showing the power of social media as a form of communication. Phase Three is still in development and it includes the creation of a blogging conversation with citizens, streaming live video and making real-time crime data available to citizens. Despite some negative posts, the department’s site has gained more than 1,300 new likes since February 2014. All this has happened despite internal and external concerns about the technology pitfalls of inappropriate use. To address those, the department set clear parameters for the publication of personal information pursuant to law. Secondly, it explained and provided training not only in the law enforcement officer code of ethics, but also in the pitfalls of social media. When it comes to restricting what law enforcement personnel do and say through social media, the department found that it was difficult for some officers to accept. In order to lay the groundwork for what could have been a very controversial policy, change was needed to educate those who would be affected. A team was created consisting of an assistant city attorney and two deputy chiefs who continuously delivered the new social media training to department personnel. The team needed to frame the training as a benefit to personnel rather than an ultimatum from management. In the final analysis, open government needs additional communication mechanisms to be truly effective and the use of social media can be one of those tools. After all, studies such as one published by the IACP Center for Social Media in 2013 indicate that 95.9 percent of police departments use social media, 92.1 percent use Facebook, 64.8 percent use Twitter and 73.1 percent indicate that social media has improved police-community relations in their jurisdictions. While it’s not easy, it works when put in place with thought and action.